I’ve been photographing and updating my Etsy shop with the antique lockets that local shoppers have been snapping up at my market events for quite some time. I love the style of the antique patina locket settings I’ve found and think they compliment my paintings perfectly – just like treasured heirlooms found in your grandmother’s jewelry box. I’m always on the hunt for the perfect shade of Czech glass beads or tiny vintage brass charms to adorn the necklaces. This is precisely the reason why it’s taken me so long to add many of the styles to my online shop – if I run out of a certain bead or charm, I need to take new pictures. 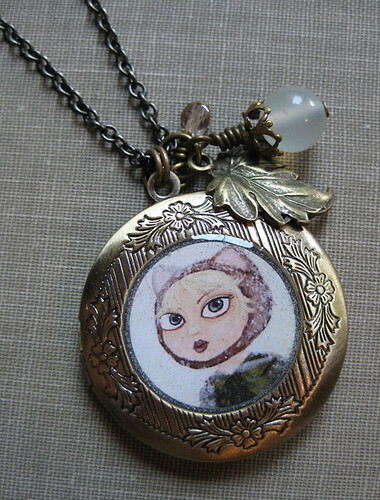 I have folders full of pretty locket photos languishing on my hard drive, some with me wearing them too (oh, self portraiture…how I loathe thee! ), that unfortunately can’t be used anymore because I’m completely sold out of a specific charm. 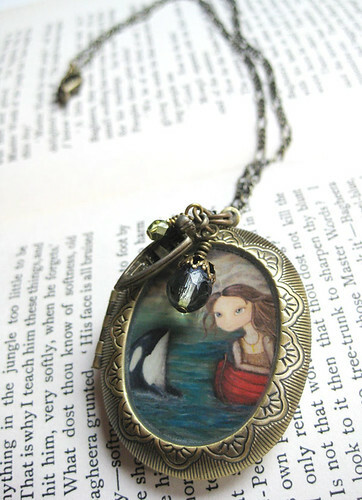 Hopefully one day I can design my own and have them made specially for me. Wouldn’t that be fun? 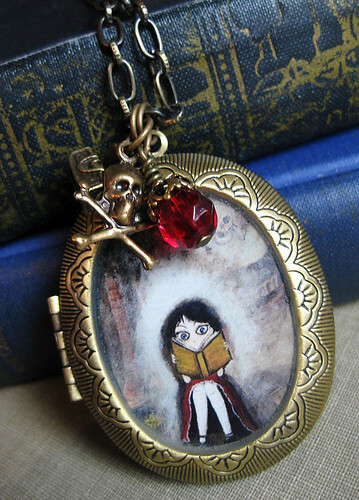 All of the lockets open up too, so you can put your own little picture or note inside. Someone asked me what was inside my own the other day & I replied, “Nothing, yet.” I opened it up to show my curious friend what the inside looks like anyway & discovered a pill that I’d completely forgotten about! Apparently the lockets can also store medication, just make sure you set a reminder!